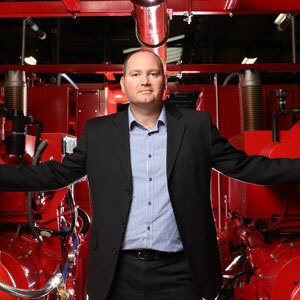 Grundfos is a global leader in advanced pump solutions and a trendsetter in water technology. We contribute to global sustainability and focus on clean water, sanitation and climate change by pioneering technologies that improve the quality of life for people, thereby showing concern for the planet. It is our commitment to being responsible, thinking ahead and innovating that enables us to meet our clients’ needs on all levels. Water gives life to people, animals and plants and is a necessity for industries to maintain production. Water is essential when heating and cooling buildings, and is also used to drain off waste products. Therefore, anywhere where water is a coveted resource, or needs to be drained away, Grundfos plays a central role. We specialise in circulator pumps for heating and air-conditioning, as well as other centrifugal pumps for industrial applications, water supply, sewage, dosing and disinfection, and fire protection. In addition to pumps and pump systems, Grundfos develops, manufactures and sells energy-efficient standard and submersible motors and state-of-the-art electronics for monitoring and controlling pumps. With electronics built into the pumps, they become “intelligent”, i.e. capable of assessing the demand for water and adapting their performance accordingly – all of which results in a significant reduction in energy consumption. Grundfos has developed a number of ground-breaking technologies within a sustainable perspective – for example Grundfos BioBooster, which effectively cleans industrial wastewater at source; and Grundfos LIFELINK, AQtap water dispenser unit and AQpure, a solar-powered water treatment unit for drinking water in the poorest areas of the world.